← Raising aerobic fitness, developing abilities – how schools and happiness make a difference. Why every child has a chance to become a genius in 2018! Every user of social media will have come across the many and varied video streams that set out to educate and inspire each day. Here’s one from Goalcast, covering musician/comedian Tim Minchin’s acceptance speech of an Honorary doctorate from the University of Western Australia, where he had previously studied for his Arts degree. All the world’s leading advocates of ‘what works best’ are clear about the need to become really expert in the things you are passionate about. If you don’t have a passion, still get your head down and learn stuff, because it is in the acquisition of knowledge, skills and understanding (KSU) about a person or a subject that a passion can be discovered, be that of course love for the person or the field of enquiry. The header for this week’s blog comes from the Walltowall people who run the Child Genius TV series for Channel 4 and they are looking for gifted children aged 8-12 (and their families) to take part. Casting Assistant Producer Anna Greenaway wrote to me today to inform me of the above, and added in her email: “Currently I am seeking applications for the 2018 series and would love to hear from the parents of gifted and talented children who may be interested. Additionally one of the last weekends in January we will be holding a Mensa backed Open Day and are keen to speak to parents who might be interested in registering their child/children for this whole day event. 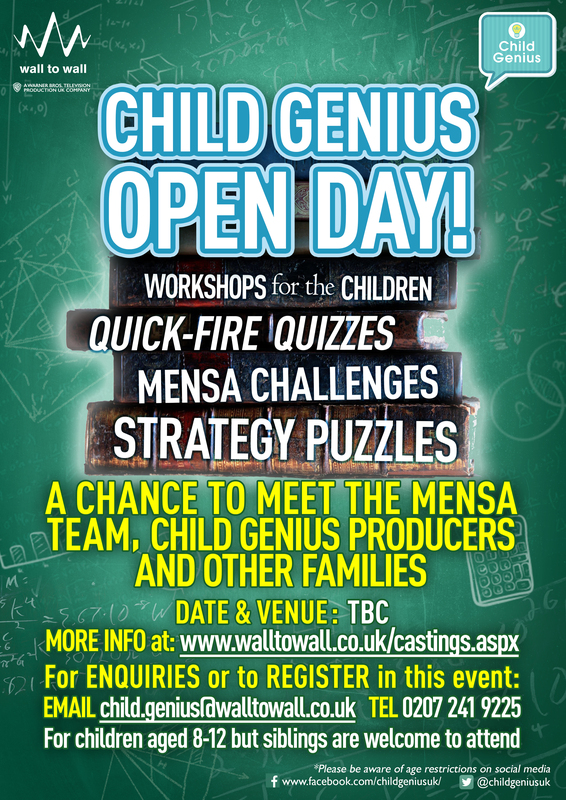 This is an opportunity for 8-12 year olds to get involved in Mensa Challenges, quick fire quizzes, Strategic puzzles being just a few examples, but also to meet with other families”.